Technology has made our lives easier in many, many ways, and I've talked about quite a few, but I want to take minute to address what may be my least favorite risk of relying on technology - data loss. If those words make you feel a pang of frustration, I am with you. No one likes to lose copies of their work, especially if the digital versions were all you have. 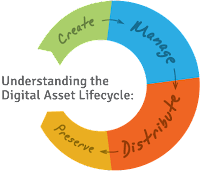 As a photographer, Digital Asset Management is very important to me. There is no other option than to be careful with my files because losing them means reshooting, and some images can’t be recreated - events that have passed, client work that’s sold, moments in time that are no more. With that said, this is just as important to the rest of you out there, whether you paint, sculpt, make jewelry. So how do you prepare in advance to make data loss no big deal? The answer is a good system of organization and backups. I know that sounds simple (and trust me, you should keep it simple), but it’s one of those things many of us don’t take the time for. All you need is a system and reminders to keep it up. Together we can streamline and protect your digital assets. #1. Backups will become your best friend. At the very least you should have one backup, be it cloud or an external hard drive. I’d honestly recommend both depending on the files. For photos, having the actual hard drive works better since you’re likely keeping some larger files. For documents, cloud services like Google Drive, Dropbox, etc. work nicely, but it’s always wise to be careful with sensitive information, logins and financials for example. Those probably shouldn’t be in the cloud just in case your files are compromised. I use a bunch of tools so I have more than one option should a problem arise. I have several backups for my client photos, but I also share proofs via Dropbox so both of us can access those. Google Drive and Microsoft OneNote help me keep up with written content, such as this blog post while in the writing stage. The other key benefit of backups is not being tied to one piece of hardware. If something happened to your computer, you should be able to access external hard drives and cloud services on other devices so nothing is lost. #2. Start looking forward, not back. It can be intimidating to rename and reorganize your files, so start now with everything moving forward. You can take the time to fix past files later a little at a time. Don't try to do it all at once because you’ll lose your motivation very quickly and this should be a long term priority. Factor in one hour a week to fix old files, and in time you’ll be set. #3. Pick a consistent folder structure. It doesn't have to be complicated. In fact, it shouldn't be because you need to be able to keep it up. For photo files, I personally use the date so everything is chronological and then a descriptor. For example - 20180324_Headshots. That way I can easily navigate to the folder I need based on when the shoot took place, but I can also search by client or project name. If you’re tracking your work, you might break it out by session, series, individual piece. Whatever works for you. For other file types, I use client name for the main folder so they appear alphabetical and then store specific projects inside. #4. Come up with a file naming convention. Make sure you choose a format you can easily implement. I recommend including the date and a quick descriptor, similar to the folder. Many photographers also include their initials for branding sale, and that can be smart as well. The file name for photos you use online can help with searchability, but that’s a whole other blog post. Consistency is most important. As a photographer, my go to tool for organizing and editing images is Adobe Lightroom. This software is designed for handling raw files, but it works with pretty much any images, and it has a builtin system for keeping them cataloged. You can group them by collection, add descriptive keywords, differentiate the best by star ratings so you can sort, and so much more. The editing options make take a little more to learn and may not be what you personally need, but the catalog is awesome for organization.